Mr Chojiro Tani was born in Kobe, Japan in 1921 and began studying the art of Karate during Junior High School at the Gojo School of Karate. He entered Doshisha University in 1940 and furthered his studies of karate under the direction of Ken-na Mabuni. In 1948 he opened the Shukokai School of Karate in Kobe, where he taught Tani-ha Shito-Ryu. He also organised clubs in Kyoto University and Osaka College of Economics, Tottiro University and Kobe University Medical School. Outside of Japan, Tani's style spread mainly in Europe (Kofukan International). Shigeru Kimura, one of the students of Chojiro Tani then promulgated Shukokai to the United States, whilst Yoshinao Nambu continued to teach in Europe. Shukokai enchances the traditional styles of karate by blending it with the logical principles behind modern sporting dymanics. 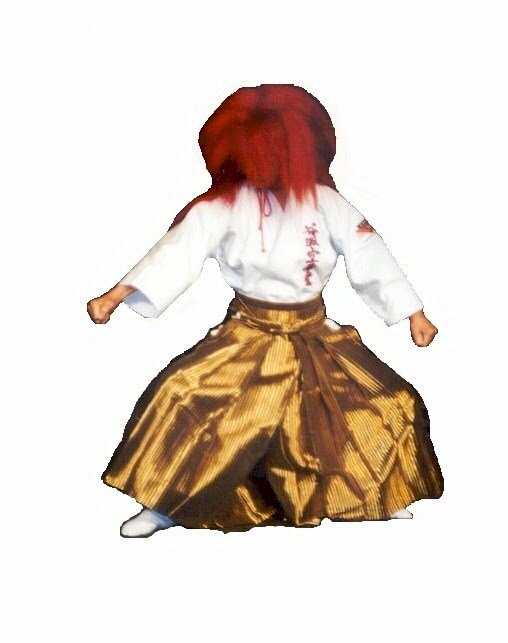 Master Tani demonstrates the long and exquisite Kata "Suparimpai", in a stark red wig which all but covers his face and his gi embroidered in resplendent gold, he looks like a reincarnated Kami (a Japanese God). Is the master fighting an imaginary opponent or invoking some timeless elemental spirit? The Portland Leisure Center Audience on 16th November 1986 witnessed moving Zen. The performer is one with the Kata, representing the pinnacle of achievement in the marital arts. A legend in his own lifetime, Master Tani is a humble man whose youth was spent during the most harrowing period in his countries history. He founded and leads the Tani-Ha Shito-Ryu organization of Shukokai Karate. It was a great honor to meet and speak with him. Sensei, where were you born? Kobe Japan. I have been studying Karate for fifty years. Does anyone in your family train in Karate? Who has had the greatest influence upon your karate? Mr. Mabuni Kenwa - the most famous Karate teacher. How has Karate changed since you started training? Karate has changed. Previously, students adhered to the code of ancient budo - no fighting. Nowadays, with the advent of sports Karate, championships predominate. I can't say that it is a bad thing - previously, there was a small, elite group doing Karate. Now, sport karate is for everyone. This may be a good or bad thing, but some of the serious meaning of Karate has been lost. Previously, Karate was used in real fighting, to defend oneself, now it is used for competition. Do you train in weapons? My senior students train in weapons but I do not train with them a lot myself. I put more importance on kata than weapon practice. Do you have a favorite Karate technique or Kata? I always demonstrate the Kata "Suparimpai", one hundred and eight techniques. Do you have many ladies and children amongst your students? Yes. Karate is excellent for health; everyone can benefit. What sort of qualities do you aim to foster in your students? In Japan, especially the children, I teach to become strong in character and to have good control over the self - not violence. I never advocate violent behavior. Sensei, have you ever wanted to give up Karate? Before and during the second World War, the Karate training was very , very hard. At that stage I thought to give up, but did not. Is there any thought on Karate which you would wish to share with your students? Karate is not just punching, kicking, and blocking - that is technique. Karate is an art. Everyone should have a high goal and ideal. Strive for achievement; not low level but high level.